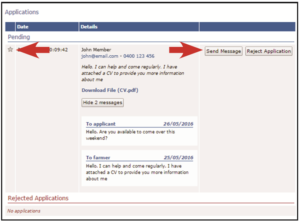 When a member replies to your job ad, you will receive a system-generated email that has a personal message from the member and their contact details. From this point, you are in total control of all future communication and you can choose which contact method you prefer to use. You can contact them via phone, email or take advantage of our private messaging system where your direct contact details are hidden until the time you share them with members yourself. To communicate with members via the Farmer Assist messaging system, simply login, go to your ‘Profile’, click on the ‘My Jobs’ button and scroll down to ‘Applications’. You will also receive an email notifying you of any unread member messages and you can click on the link in the email to be able to read these. You can shortlist potential applicants that you like by clicking on a star next to their application so you can go back to them later. 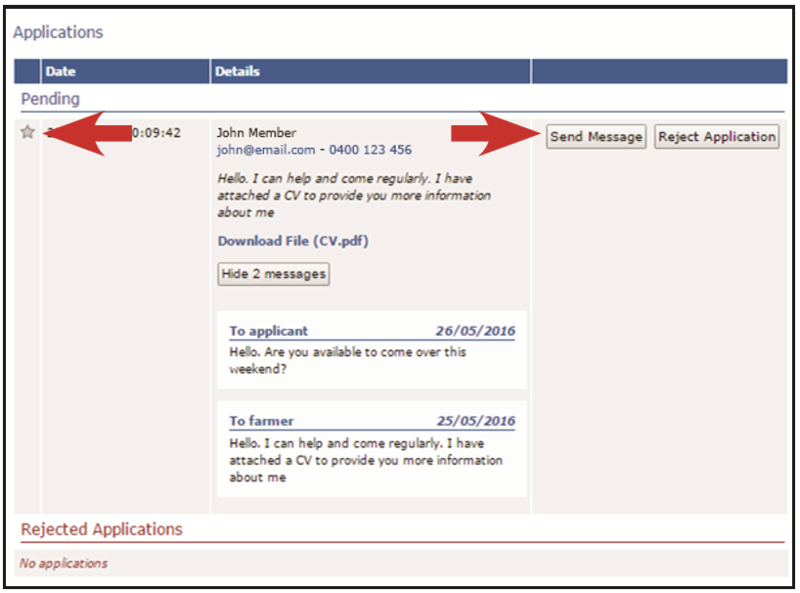 By clicking the ‘Send Message’ button, you can send replies directly to potential applicants or click the ‘Reject Application’ button to reject any application not suitable. Rejected applications will receive a system-generated email letting them know that they were unsuccessful. We recommend rejecting all applications from members that you do not select for the job. Messaged applicants will receive a system-generated email notifying them that you are trying to communicate with them. This will include your personal reply but no other contact details. The system allows you to send and receive as many messages as you need to prior to making other arrangements with successful members. When you have received a sufficient number of applicants to choose from, it is advised that you change the status of your job to ‘Pending’. This will remove the ability for other members to apply for your job.